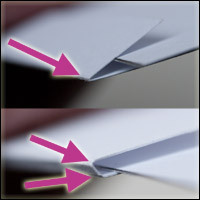 If you enjoy the paper engineering projects on the robives.com website, you'll love the membership package. For just £3 a month you get access to all sorts of exclusive member's content from quick craft projects to complete animated paper models. Levers eBook. New YouTube Video! Watch the YouTube video revealing how the Levers eBook is put together. A fun and educational ebook project to download, cutout and make. The pack comes as a 25 page pdf file with all the parts and instruction that you need to find out all about levers, how they work, and what they are used for. Grrrobot! Now with YouTube video! Check out the YouTube video showing how I developed the Grrrobot model and revealing how the clever mechanism works. Grrrobot is a fabulous model for you to download, print out and make. Press down on the Grrrobot model's head and he raises his arms in a fierce gesture as if thinking, "I will destroy you all!" Release the model and his arms return to their position using a GFPS (Gravity Field Power Source) – actually some coins in a tube. The mechanism is fun and the model is fearsome. What more could you want! Hurry along to the website and grab yourself a copy now. Dog Ate My Homework Postcard. Not many left! Last chance to receive a limited edition postcard signed, numbered and posted by yours truly. 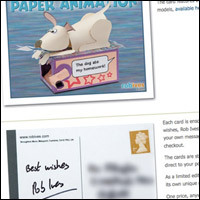 The card features the Dog Ate my Homework models and is printed on high quality glossy card. There are only a few postcards left so don't miss your chance!